JNN 26 Dec 2014 Baghdad : “Iran was the first country that backed up Iraq against the terrorists’ invasion at a time when we needed possibilities to fight the terrorists,” President Massoum said in a meeting with Iranian Parliament Speaker Ali Larijani in Baghdad on Wednesday. During the meeting in Baghdad, Massoum stressed the necessity for the expansion and strengthening of the relations between Iran and Iraq in all fields, and called for continued meetings between the two countries’ high-ranking officials to confer on ways to settle the regional problems. Last month, the Iraqi president in a meeting with Iranian Ambassador to Baghdad Hassan Danayeefar appreciated Tehran for its key role and assistance to Iraq in the war on terrorist groups. Danayeefar, for his part, congratulated the Iraqi people and government for their recent giant victories against the ISIL terrorist group, and underlined Iran’s continued support for its Muslim neighbor. Iran and Iraq have enjoyed growing ties ever since the overthrow of the former Iraqi dictator, Saddam Hussein, during the 2003 US invasion of the Muslim country. The two neighbors have further strengthened their military ties following a surge in terrorist attacks against Iraq. Speaking in an interview with the American CNN television in September, Iranian President Hassan Rouhani said that Iran will resort to any possible means to protect the holy sites in Iraq, including those in Karbala and Najaf, and the country’s capital city of Baghdad from the terrorist attacks. Also, in November, Lieutenant Commander of the Islamic Revolution Guards Corps (IRGC) Quds Force Brigadier General Esmayeel Qa’ani said Baghdad remained untouched by ISIL terrorist group due to Iran’s support and assistance. “The ISIL terrorists sought to surround Baghdad but they failed in reaching their ominous goals thanks to Iran’s supports,” Qa’ani said in North Khorassan province. On the way to Baghdad, Larijani made a stop at Al-Najaf where he met with leading Shiite cleric Ali Sistani and stressed the dire need for cooperation of all Muslim countries with Iraq to eradicate terrorism, and the danger of the Islamic State in Iraq and the Levant (ISIL). In a joint press conference with his Iraqi counterpart Salim Al-Jabouri, Larijani said that Tehran would support some countries’ move against ISIL, though he declined to comment on reports that Iranian jets had struck terrorists’ posts on Iraqi soil. Yet, he emphasized how Iraq’s stability was essential for Iran and the region. In the meantime, Larijani warned of any foreign intervention in the Iraqi affairs, which will harm the country, the neighboring states, and the entire region’s economy, territorial integrity and even social fabric. Meanwhile, Iraqi reports said General Qassem Suleimani, commander of the Quds Force of Iran’s Republican Guards was leading voluntary groups in the war against ISIL. But the Iranian Defense Minister Hossein Dehghan soon quashed the reports, saying there was no need for a ground intervention by Tehran in the war. Iran will only do if the Holy Shrines, a red line, are threatened, he stressed. Earlier, Iran’s Deputy Defense Minister Reza Toulabi revealed that Tehran and Baghdad were coordinating on the matter. By the same token, Iraq’s Foreign Minister Ibrahim Al-Ja’afari, during his last visit to Tehran, said his country did not oppose Iranian airstrikes against ISIL on Iraqi soil. In addition, Iran’s Foreign Ministry spokesperson Marzieh Afkham expressed relief over the recent victories by Iraq against ISIL, hoping a final triumph will be realized. 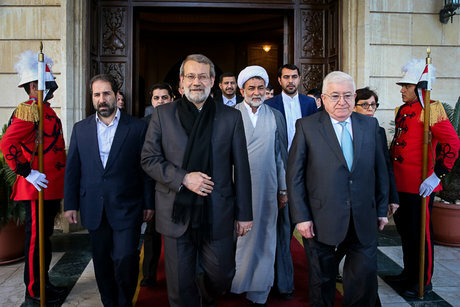 Economic ties were not less important on the agenda of Larijani’s visit. Discussions addressed economic developments in the region, focusing mainly on sharp fall of oil prices. For Larijani, the decline in oil prices is a “conspiracy.” He said that Iran would overcome the crisis, through cooperation with Iraq. This entry was posted in Iran News, Iraq News, Middle East and tagged Ali Larijani, iran, Irani Foreign Minister, Iraqi Foriegn Minister, Iraqi President, President Massoum. Bookmark the permalink.